retaining long-term customer's relationship. Our focus is on growth - ours and yours. because our future depends upon your success as well as our own. 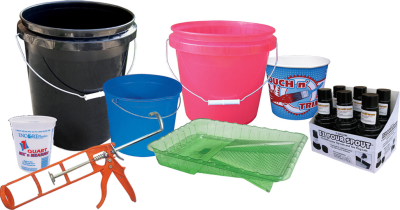 INDUSTRIAL PAILS Based on standard colors only! (11 colors available) • 1 Gallon Pail and Lid = 6,480 • 2 Gallon Pail and Lid = 4,000 • 3.5 Gallon Pail and Lid = 2,340 • 4.25 Gallon Pail and Lid = 2,340 • 5 Gallon SE Pail and Lid = 2,400 • 5 Gallon 70m Pail and Lid = 2,304 • 5 Gallon 90m Pail and Lid = 2,304 • 5 Gallon UN Pail and Lid = 2,304 • 6 Gallon Pail and Lid = 2,304 Custom Colors are available at higher minimums. Minimums vary depending on pail size. Please contact our Sales Department to discuss specific color, lead times and pricing at 1-800-336-2673. COLORS AVAILABLE: White Black Yellow (PMS 116*) Green (PMS 347*) Orange (PMS 173*) Blue (PMS 300* or PMS 2935*) Dark Blue (PMS 280*) Red (PMS 200* or PMS1815*) Gray (PMS - Cool Gray 8*) For minimum order on standard color see Sales Manager. * PMS colors are provided as a close representation of the substrate colors. INDUSTRIAL PAILS: • Based on 1 color print • Print minimum is increased as additional colors are added to artwork. Up to 4 colors print available. • Printing not offered on industrial lids. 1 Gallon = 5,400 2 Gallon = 4,000 3.5 Galllon = 2,340 4.25 Gallon = 2,340 5 Gallon SE = 2,400 5 Gallon 70m = 2,400 5 Gallon 90m = 2,016 5 Gallon UN = 2,304 6 Gallon = 2,112 Please contact our Sales Department in the event you cannot meet our print minimums. In many cases we are able to meet customer requests call 1-800-336-2673. Q1. Can food be packaged in your containers? A1. Yes, the resin used in most of our containers has the FDA approval for storing and packaging of food products. However, this only applies to products made from virgin material and not from regrind material also known as Econo-Blend. 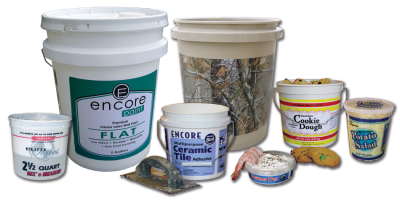 It is also recommended that you purchase your food grade containers direct from Encore or a reputable distributor. We also suggest that you never use “used containers” for storing food products unless they were previously used for a food product. Q2. How come I cannot purchase the exact number of lids as the containers? Q3. Do you offer print on your containers? A3. Yes, depending on the size of the container we can print up to six colors. Q4. What print process do you offer? A4. We use Dry “Off-Set” printing. We also offer Heat Transfer Labels for 3.5 gal, 4.25 gal, & 5 gal containers only. Q5. What is the minimum amount that you will print? A5. Again this depends on the size of the container. Please click on the link for full details of our print minimums. Q6. What are your lead times for printed products? A6. This can vary greatly depending on quantities, container size, availability, number of colors and other factors. The entire process on an order from start to finish ranges from 3 to 8 weeks. Once credit is approval and all artwork as been approved and finalized, we can then go to production and complete the order. Q7. What is the additional cost to have something printed on my containers? A7. Unfortunately it is very difficult to quote a price without first seeing what it is that we will be printing. Much of this greatly depends on the quantity along with the number of colors to be printed. Q8. What colors are available? A8. Our stock colors are White, Black, Chevron Blue, Forest Green, Gray, Orange, Mobile Red, Shell Yellow, Red, Silver and BP Green. Q9. Are other colors available? A9. Other than the stock colors listed above, we can pretty much get any color that you need providing that minimums are reached. Q10. What are the minimums for colored containers? A10. For stock colors, please clink on the link. For custom colors, please contact our Customer Service department at your convenience. Q11. Can I order lids without a gasket? A11. Yes, but only when ordering in truckload quantities. A2. The basic principle of sustainability is the balance of a growing economy with social responsibility and protection of our environment. Q3. Why is sustainability important? A3. As the world’s population continues to expand, energy usage and manufacturing will grow with it. This could have serious consequences unless we find ways to use fewer resources. Q4. Does practicing sustainability cost more? Q5. What is corporate sustainability? A5. Corporate sustainability puts practices and policies to work that aim to protect, support and enhance both the human and natural resources needed in the future. Q6. Is Encore a green company? A6. Yes, Encore recycles the water and oil used in its manufacturing processes. The scrap plastic is also recycled. Encore is paperless and continues to upgrade equipment with energy efficient machinery that increases hydraulics and decreases electrical usage. Q7. How does EcoSmart Save Resources? A7. EcoSmart saves resources by taking yesterday’s products and recycling them into new products. Plastics are an oil derivative so less is needed in the manufacturing process. Q8. Are other Encore items available in the certified EcoSmart Program? A8. Yes, nearly every plastic item Encore produces can be made available with recycled plastics. A1. The reason to make EcoSmart a part of your assortment is the growing need to reduce stress on our landfill and lower the consumption of oil. Q1. What is the difference between a .70 or .90 mil 5 gallon pail? A1. The .90 mil pail is heavier, sturdier and is more commonly used throughout the industry. The .90 mil pail should always be used when packaging paints, chemicals or heavy materials such as driveway sealer, tars, detergents, etc. The .70 mil pails are recommended when packaging a dry lightweight material such as sawdust, safety kits, fasteners, etc and not exceeding 45 lbs. Q2. Can your containers be used for all chemicals? A2. No, our containers are NOT UN Rated. Please check with the chemical manufacturer or proper government agencies to see if a UN Rated pail is required for your material(s). Q3. Are your containers food grade? A3. Yes, all of our containers are made from a virgin FDA approved resin except the Econo-Blend containers which are made from regrind material and are not food grade. Q4. What is the difference between your virgin and regrind material? A4. Besides the fact that regrind pails can not be used in the food industry, the biggest difference is pricing. Generally regrind pails are approximately 15% to 20% less than virgin material pails. However the drawback is that regrind pails are generally not as durable as pails made from a virgin material. Q5. Do you offer matching lids? A5. 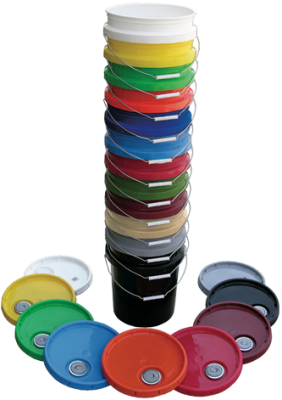 Yes, we manufacture lids which are available in the same stock colors listed above. Q6. Is there an up-charge for colored pails and lids? A6. Yes, there is a small up-charge for colored pails and lids. Q7. Are there minimums for purchasing a stock color? A7. Yes, however the minimums vary depending on the size of the container. Please contact our Customer Service department and let them know which sizes you are interested in and we can provide your minimum requirement for that specific item. Q8. What if I want a color other than the stock colors listed above? A8. We can produce almost any color imaginable, however minimum quantities are higher and a small up-charge will apply. We can provide exact details after we are sent a sampling of a specific color. Q9. What are your lead times? A9. Lead times will vary depending on color and quantity. Typically stocked items ship within 3 to 5 business days. However, non stocked items such as colored items or customized items normally take anywhere from 2 to 6 weeks to produce and ship. Q10. Do you offer printing capabilities on industrial pails? A10. Yes, we offer off-set printing with 4 color capabilities. Q11. What are the minimums for printed pails? A11. Minimums vary depending on the container size and number of colors to be printed. Please contact our Customer Service department for more information. Q12. What is the minimum amount that you will print? A12. Again this depends on the size of the container. Check with Customer Service or Sales for full details of our print minimums. Q13. What are your lead times for printed products? A13. This can vary greatly depending on quantities, container size, availability, number of colors and other factors. The entire process on an order from start to finish ranges from 3 to 8 weeks. Once credit is approval and all artwork as been approved and finalized, we can then go to production and complete the order. Q14. What is the additional cost to have something printed on my containers? A14. Unfortunately it is very difficult to quote a price without first seeing what it is that we will be printing. Much of this greatly depends on the quantity along with the number of colors to be printed. Q1. What is the recommended temperature range for polyethylene containers? A1. Containers are recommended for temperatures ranging from heat temperatures of 160 degrees Fahrenheit and freeze temperature to –5 degrees Fahrenheit. Q2. Are the polyethylene containers food grade? A2. Yes, we use a virgin FDA approved resin. Q3. Are the containers microwavable? A3. No, we do not recommend using these containers for reheating as temperature should not exceed 160 degrees Fahrenheit. Q4. What colors are offered? A4. White and Natural are the most common colors and is what is stocked. Other colors are available upon request so long as minimum requirements are met. Q5. What are your minimum requirements for colored containers? A5. The minimum requirements range from 25,000 to 50,000 pieces for stocked colors. Non stocked colors are available with higher minimums. Please call our Customer Service department for more information. Q6. Is there an up-charge for colored containers? A6. Yes, however, this depends on the container size and selected color. Q7. Can your containers be printed? A7. Yes, our containers can be printed with artwork up to 6 colors. Q8. Can your lids be printed? A8. Yes, as with the containers, lids can be printed with up to 6 colors. Q9. What are the minimums for printed containers? Q10. What is the maximum print area? A10. Due to the many different sizes available, the print area is specific for each container. Please contact Art department for exact dimensions. Q11. Who is responsible for the artwork & plate cost? A11. The customer is generally responsible for all the cost associated with creating new artwork. Q12. What if I am already purchasing printed containers from another source? A12. Encore will duplicate all artwork at no charge provided that no changes to the artwork are required. Q13. What is the cost for creating artwork and plates? A13. This depends on the number of colors to be printed. Once you have selected the number of colors to be printed, Customer Service can provide you with an exact cost. Q14. Is someone available in house to help? A14. Yes, Encore offers its own in house Graphic arts department which will assist you through the entire process. Q15. How do we prefer to receive the images/artwork? A15. We prefer to receive the digital artwork in MAC format, we prefer Abobe Illustrator or a PDF file and can sometimes work directly from an e-mail. Programs to use includes Illustrator, Freehand and Photoshop. Q16. What does 5 pounders and 10 pounders refer to? A16. People in the packaging industry sometimes refer to 80 ounce containers as 5 pounders and 160 ounce containers as 10 pounders. Q1. What is a “Tamper Resistant” container? A1. Our Tamper Resistant line offers the customer an inexpensive alternative to foil sealing and shrink banding to safely package a product to deter tampering. Q2. Are your containers 100% safe against tampering? A2. No, to our knowledge no container is 100% safe against tampering. However our containers do offer a very tight fitting lid which can easily be removed only after the “break tab” has been removed. When the “break tab” is attached securely, the lid is very difficult to remove which in most cases will prevent tampering with the product inside. Q3. What material are your containers made from? A3. Our Tamper Resistant containers are made from virgin Polypropylene. Q4. What is the recommended temperature range for using these containers safely? A4. The advantage of Polypropylene is that it retains its strength at temperatures exceeding 180 degrees Fahrenheit. However, these containers should not be used when packaging frozen products or used in temperatures below 35 degrees Fahrenheit. Q5. Are the Tamper Resistance containers food grade? A5. Yes, we use a virgin FDA approved resin. Q6. Are these containers microwavable? A6. All polypro containers are made from microwave safe materials, but be sure to vent lids to allow steam to escape during microwaving. Do not microwave over 5 minutes. Do not microwave food with high fat (such as butter) or sugar content, each of which may cause the plastic to warp. Q7. What colors are offered? A7. White and clear are the most common colors and is what we stock. Other colors are available upon request so long as minimums requirements are met. Q8. Is there an up-charge for colored containers? A8. Yes, however this depends on the container size and selected color. Q9. Can your containers be printed? A9. Yes, our containers can be printed with artwork up to 6 colors. Q10. Can your lids be printed? A10. Yes, as with the containers, lids can be printed with up to 6 colors. Q11. What are the minimums for printed containers? A11. This depends on the number of colors to be printed. Contact our Customer Service department for exact minimum requirements. Q12. What is the maximum print area? A12. Due to the many different sizes available, the print area is specific for each container. Please contact our Customer Service department for exact dimensions. Q13. Who is responsible for the artwork & plate cost? A13. The customer is generally responsible for all the cost associated with creating new artwork. Q14. What if I am already purchasing printed containers from another source? A14. Encore will duplicate all artwork at no charge provided that no changes to the artwork is required. Q15. What is the cost for creating artwork and plates? A15. This depends on the number of colors to be printed. Q16. Is someone available in house to help? A16. Yes, Encore offers its own in house Graphic arts department which will assist you through the entire process. Q17. How do we prefer to receive the images/artwork? A17. We prefer to receive the digital artwork in MAC format, we prefer Abobe Illustrator or a PDF file and can sometimes work directly from an e-mail. Programs to use includes Illustrator, Freehand and Photoshop. Q18. What are your Lead Times? A18. Stocked items generally ship within 3 to 5 days after receipt of PO. Printed or special orders can take anywhere from 3 to 6 weeks. Q19. How can I order? A19. Call our Customer Service department at 800-336-2673 and they will be happy to assist you. Encore's goal is that all products meet the highest standards of performance and durability. We have strict quality testing to meet UN standards. We continue to improve mold designs and bring new inovated ideas to the table. Are professional Customer Service dept. is here to help you the customer before, during and after a purchase. We work closely with each order.